GHoPA (Get Hooked on Positive Activities) boss Mark Fenty and coaching staff were delighted to welcome 2 YMCA clients as new volunteers. Based at Peaks Lane, the project has recently delivered a number of archery sessions in the sports hall to many YMCA clients. 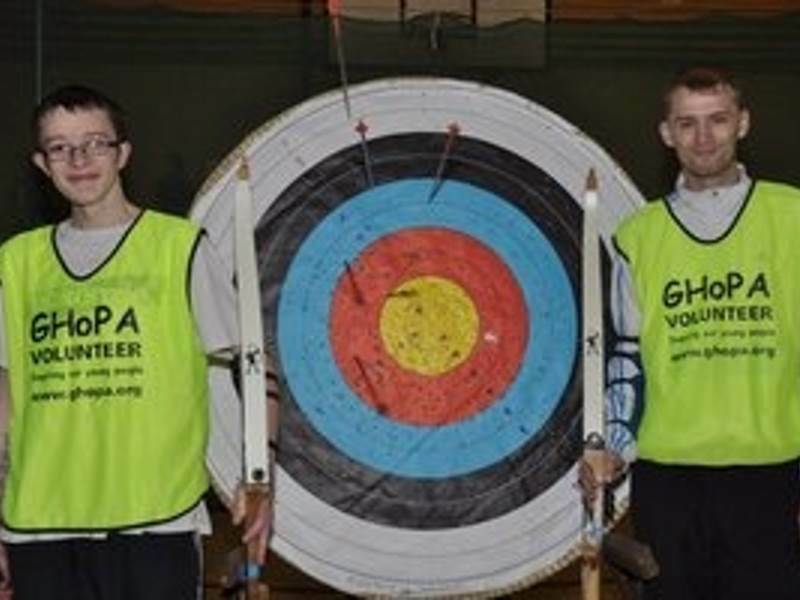 Mark and his fully qualified team of coaches identified that Liam and Jamie have demonstrated not only that they were both very competent archers but they have many additional skills they are able to add to the GHoPA organisation. Mark says “both are going to be an asset to us and soon they will be working as “peer mentor” volunteers with the coaching staff to develop a few new ideas and activities specifically designed for YMCA clients”. The GHoPA project is all about helping young people fully realise their own skills and providing them with the support to help themselves and others. Being a volunteer is a critical step towards developing personal, social and technical skills which could help towards future paid employment and being a valued volunteer will always look good on a CV. Soon the programme will launch some new programmes so keep a close eye on the GHoPA (www.ghopa.org).